Here you can find customer testimonials and links to other useful organizations and websites! One of Cinelease’s proudest achievements has been our strong bond with the lighting and grip community. We’ve achieved this by identifying a basic tenet of the film industry – relationships are key. Our opportunities to bid, supply and grow are directly related to the relationships we have with the grips, staffers and companies as a whole. 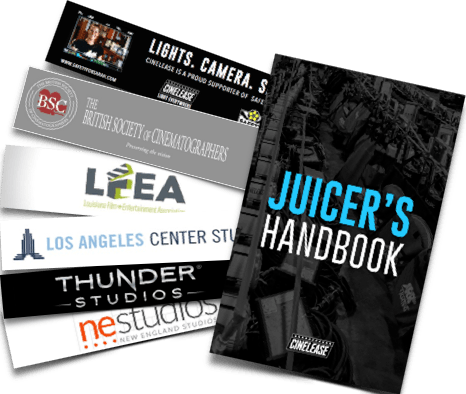 In addition to companies, Cinelease sponsors and supports multiple associations and organizations including Safety for Sarah, the American Society of Cinematographers and the British Society of Cinematographers. Our strong relationships rest at the heart of our company, and Cinelease is proud to stand with the following causes and organizations. We are committed to maintaining high inventory reputation standards and providing safe and reliable equipment. As the person responsible for overseeing physical production on all pilots and current series produced by 20th Century Fox Television, vendor selection is something my department and I take very seriously. We select only the finest rental houses to support our shows and for over 20 years Cinelease has never let us down. Cinelease always offers competitive and fair rates and has proven time and time again a commitment to customer service, technical expertise and reliability. Whether we’re filming locally in Los Angeles or across the country in North Carolina, Dallas or Shreveport, Cinelease always comes through with the equipment and support we need. “On behalf of ABC Studios I would like to take this opportunity to acknowledge the excellent service provided by Cinelease over the past decade. When we created our exclusive partnership over 5 years ago it was with the full confidence that we were embarking on a journey with a first class organization. The actual experience during this time has certainly met or exceeded our expectations. From pricing to service we feel that Cinelease has lived up to its reputation as an organization that stands by its product and lives up to its commitments. As our business expands beyond the boundaries of Los Angeles I can rest assured in the knowledge that Cinelease is equally prepared to service our needs on distant locations as it is at home. In the past 8 years Cinelease has been my equipment house of choice. I have been on locations near and far from their bases of operation and have always required their special attention. They have always succeeded in responding to my outrageous requests to have it all, while understanding I’m devoted to my budget. I rely on Cinelease to provide the most well-maintained gear, and more importantly, the most reliable service on every job, no matter how small or large. They have clearly helped me solve and afford many lighting and rigging dilemmas and I expect they will do so in the future. I cannot say enough good things about Cinelease! From start to finish, the service they provide is outstanding. Joe Ball and Chris Rogers in LA, Gary Paz in NM, and Gannon Murphy in ATL are all incredibly amazing to work with. We always feel that Cinelease is fair and operates with integrity. They take the time to understand your show’s needs and budget parameters, never acting pushy or applying undue pressure. They become equipment collaborators and they genuinely want you and your project to succeed. The Cinelease crew goes out of their way to help you figure out how to make the gear and packages work within each show’s unique structure. Throughout your shoot, the customer service remains at an extremely high level, which can be rare in this industry. We never have to worry about gear arriving on schedule because Jorge Mendoza (LA) responds so quickly! I always feel that my show and crew are taken care of and that everyone at Cinelease values the productions and the teams that they work with. I feel confident in recommending Cinelease to anyone looking for equipment rentals. No matter the size, budget, or length of your project, you will definitely receive service and care that truly are second to none.